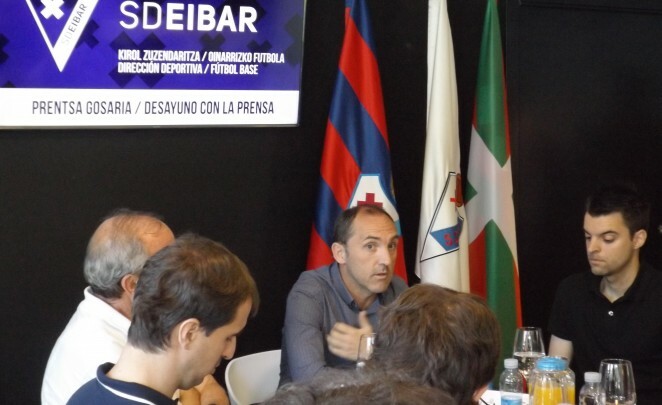 Fran Garagarza, Sporting Director of SD Eibar, explained today that the team will play ten games during the pre-season and will be based in the Austrian town of Kossen (in the Tirol region) between 27 July and 7 August. – 19 July: Real Unión de Irún (Second B division) – SD Eibar at the Gal Stadium in Irún. – 22 July: SD Eibar – Real Sociedad B (Second B) in Atxabalpe (Mondragón). – 26 July: CD Mirandés (Second A) – SD Eibar in Anduva (Miranda de Ebro). – 28 July: Rival to be confirmed in Austria. – 13 August: Real Zaragoza – SD Eibar at La Romareda (Zaragoza). Two more games are to be confirmed after the return from Austria. This announcement, made during an informative breakfast to explain the internal structure of both the Sport Direction and Grassroots Football, was also attended by the Club’s Vice-President for Sports, José María Arrizabalaga, and the Coordinator of Grassroots Football, Mikel González.